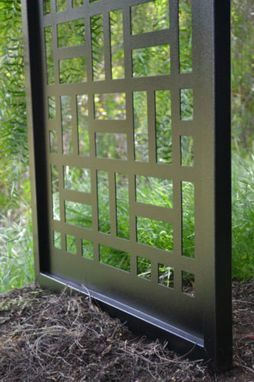 Here is an elegant handcrafted contemporary metal gate with factory-direct pricing. Regularly $1200, we offer this gate at a great factory-direct price for only $749. 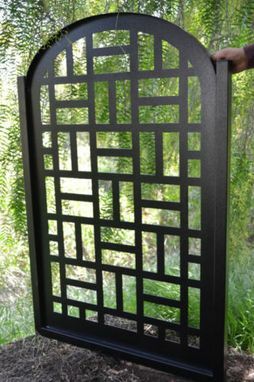 THIS IS A MODERN, CONTEMPORARY GATE reminiscent of the minimalist art of the early 20th Century. 1. Rough opening: 36". Height: 4'. Rough opening holds the gate, posts and hinges installed. The design in this listing will be fabricated for rough opening 36", height 4'. 3. Frame: Steel 1.5"x 1.5" square. Arch: Steel 1.5". 6. Fabricated for a latch. We provide quality magnetic latch. Gate can also be fabricated with one standard 2 1/8" holes for a standard lever. Customer supplies lever. 7. Includes sandblasting, baked on zinc primer and standard powder coating. Several colors available. This is a dark black powder coating. Medium gloss. Delicate hammered finish. $150 value free. Makes the gate stand out. Custom Textured Bronze. Dark brown chocolate bronze with delicate textured finish. Custom Textured Rust. Warm rust color with delicate textured finish. Custom Blue Green Aged Copper. Gate can also be finished in Natural Rust at no additional charge. Natural rust is not a powder coating. Please allow 15 business days to ship the gate. Each gate is custom fabricated per order. A great gate with clean, contemporary lines. 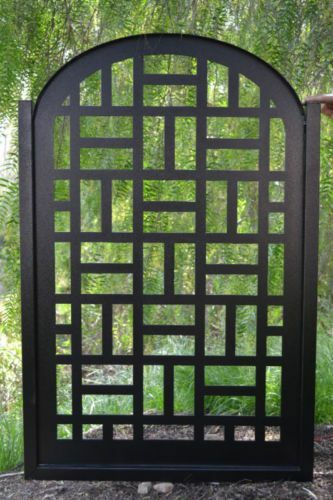 A perfect gate for a garden or entry way to a contemporary home. You cannot find an item like this at your local hardware store!